We are delighted to invite you to a series of public talks by travelling teacher Bernhard Lindner on Saturday, 26 May and Sunday 27 May. Each public talk will be about an hour-1.5hours long, followed by Q&As and a guided meditation afterwards. If you've been curious about Buddhism and meditation, this is a great opportunity to find out more from an experienced practitioner with an engaging style. Both beginners and those with more experience are welcome. 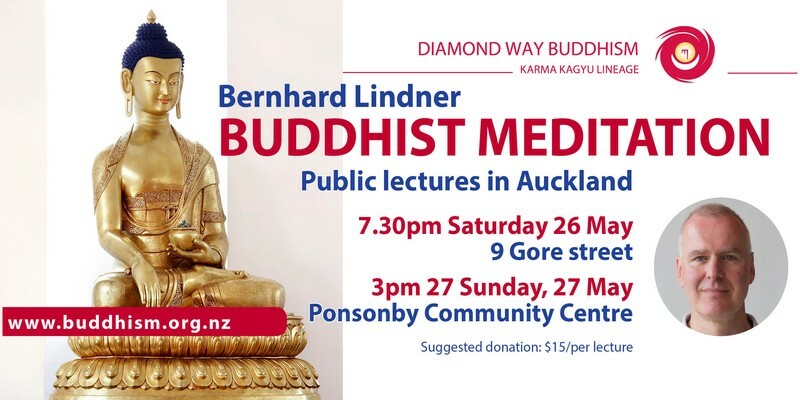 Bernhard Lindner is from Germany and has been practicing Buddhism for more than 30 years. Over these years he has participated in courses and received teachings from many of the high Lamas in the Karma Kagyu tradition. In 1994 Lama Ole Nydahl asked him to teach Buddhism. Since then he has been travelling to Diamond Way Centres around the world, giving lectures and teachings on the Karma Kagyu meditation practices. He is a freelance musician (violin) by trade and also works as a violin teacher. He lives in Munich where he is an active member of the local Diamond Way Buddhist Centre.